I love this! 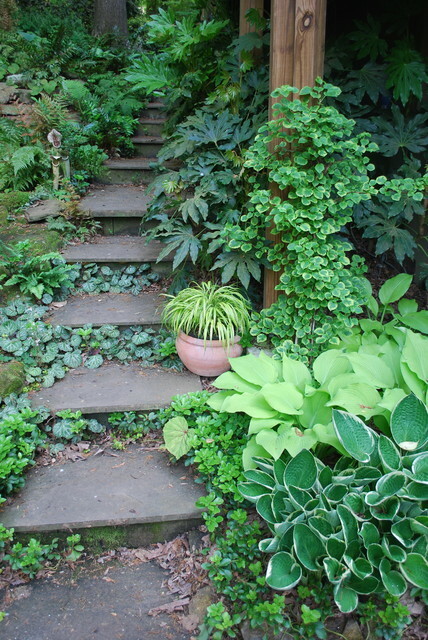 What chartreuse plants (other than hostas) do you like? - Your shade gardens are beautiful. I live in Charlotte and would love to work with you, but not sure I can afford it :) There is so much shade in the older Charlotte neighborhoods, My frieneds and I are always looking for variety. Thank you for sharing for your lovely designs! Hi, I am in South Texas and looking for things like this. I am new to true landscaping and xeroscaping. Would these plants be drought tolerant enough to do well in rocky areas? Thanks. Hi thubley. I don't think that any of these plants mentioned would work in your situation. Sorry. Climber - Hi, what is climbing up the pole? Hi. Thanks for the question. That is a climbing variegated hydrangea called Miranda. Not easy to find but very nice. what is the vine growing on the post? Notes on "in the absence of abundant light, chartreuse foliage is an appropriate choice.